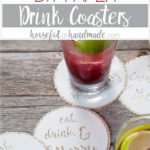 I am sharing the cut files for the drink coasters in my subscriber library. Click here to subscribe to my weekly newsletter and gain access to all the freebies. If you already have your password, click here to download them. Start by cutting out your coasters. Cut the top design with the words from the textured cardstock. If you are using the printable design, print the file with the words on the textured cardstock. Then cut the plain circles out of the glitter cardstock. 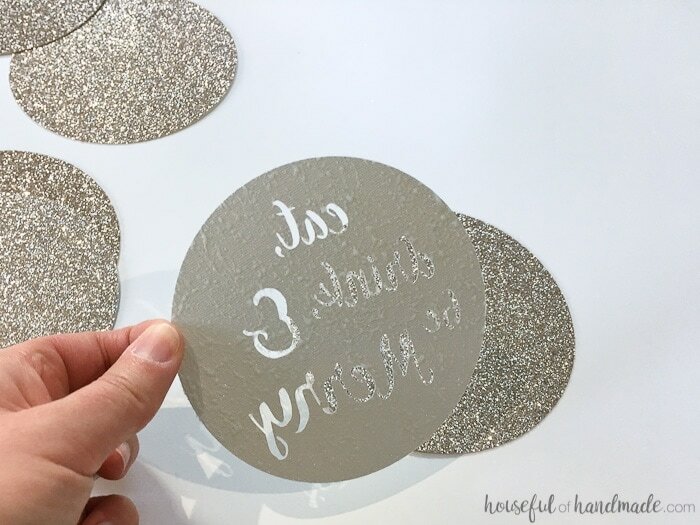 Use your spray adhesive and spray a coating on the back of the textured cardstock pieces. 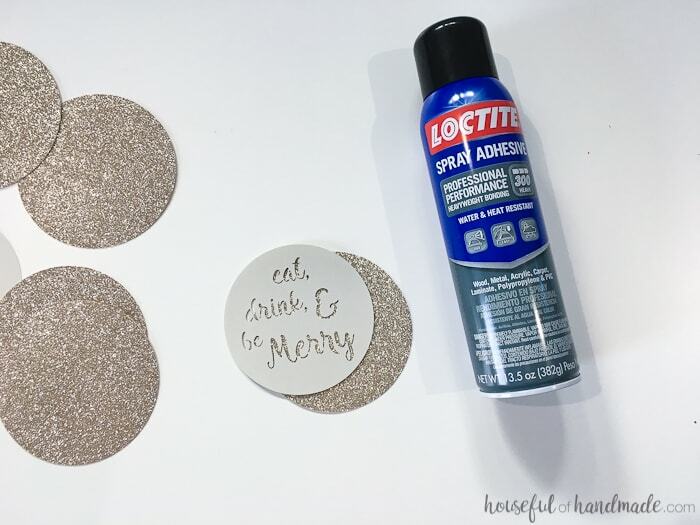 I like the Loctite adhesive that I used because it is a thicker coating of adhesive (it comes out almost in webs) which adheres nicely to the glitter surface. Center the top of the drink coaster onto the glitter circle. Press firmly and you are done! See I told you they were quick and easy to make. It really will only take you a hour or so to make a whole bunch to place on every surface you want to protect. They also add a little sparkle to your shindig. Perfect for a cocktail party! And don’t forget to enjoy these other amazing ideas for your next cocktail party! These are so cute! I’d love to make some for my friend’s upcoming bridal shower! These are so so cute! Love the glitter! One of these days I will break down and get a Silhouette machine! Love the glitter and the saying. Have a very Merry Christmas Kati! You will love it when you do! There are so many things it can do. How cute are these?! I’m obsessed! I’m also crazy about people putting drinks down without coasters, ha! Especially on a piece of furniture you really love. My kids are the worst so I dont let them ever have drinks anywhere but the dining room table! Oh my gosh those are adorable! What a great idea! What a GENIUS idea! 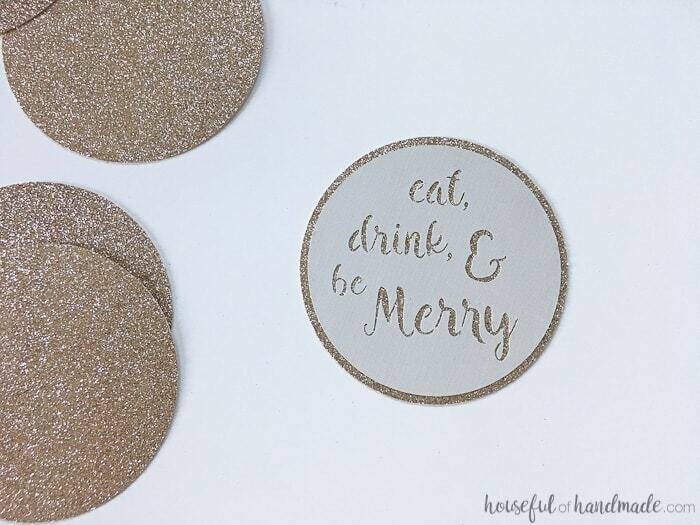 We’re having a NYE party so I will absolutely be making these with my Cricut! Thanks for sharing and happy holidays! Thanks Lydia! Have a fun party. These coasters are so pretty! I love the glitter! Thanks Erin! I’ll take any excuse to add a little glitter. Oh my gosh, these are so cute!! What a fun festive touch to a cocktail party. Merry Christmas! We definitely need a Silhouette machine in our lives. These coasters are fantastic and so creative. Thanks so much for joining our hop. Merry Christmas! What a great idea! 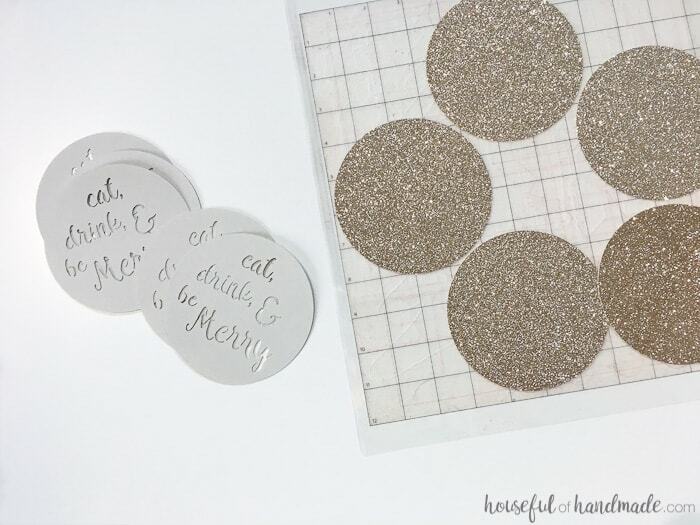 I love the sparkly cardstock you used, too – these are so perfect for any holiday, or even a bridal shower! These would be so cute for a bridal shower! Or even the wedding. Personalize them with the date or something. 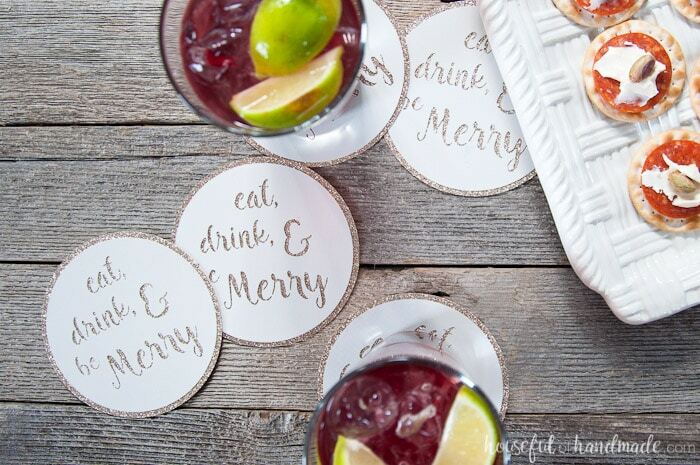 I love these adorable coasters! The glitter definitely kicks it up a notch. Thank you for sharing. Merry Christmas! Really cute idea. I think I will make some of these asap. Thanks for the idea. Thanks Maria! I love a little sparkle. Merry Christmas to you too!